eBay offers a convenient and efficient way to fulfill your men’s fashion needs. Browse our selection of sport coats, dress shirts, sweaters and other high-quality men's apparel to dress for success every day. A man's sense of style can say a lot about him as a person and make an indelible impression on others. Make sure you are dressed appropriately for all occasions. Shop for men's clothing on eBay auctions. To make searching the auctions easier for men, we have created the following guide to easily locate men's clothing at the eBay auctions. In my opinion, this is even easier then searching directly on their site. However, if you wish to use their search function, you can certainly do so from their engine. Learn more about Fashion eBay Style. eBay is one of the most popular internet fashion sites for purchasing men's clothing. A great resource for fashionable, designer clothing, shoes and accessories. If you are Looking for a a Ralph Lauren polo top, or Seven jeans, eBay is a great place to begin your shopping experience. They have an unbeatable selection for incredible prices on all of your favorite brands from great clothing stores like Old Navy, Abercrombie, and Hollister to hip items from popular designer brands such as Diesel, Coach and Calvin Klien, to couture pieces from Prada, Gucci and Louis Vuitton. They even have an amazing selection of one-of-a-kind vintage items. You can find wholesale clothing lots, affordable basics, and haute couture designer wear for men, women and children on eBay. The Apparel Buying Guide at their site can help you pick the right shoes, purse, pants, skirt, sweater or top -- you name it! The guide includes everything you need to know about fit, fabric, sizing, and basics of buying. Now it is easier than ever to shop on eBay using their clothing attributes. You can choose new in the product finder to make sure that those Nike basketball shoes you are looking for are brand new, or search by size to narrow your search to only size medium BCBG dresses. You can even search by brands in accessories, so you can browse by Christian Dior, Vera Bradley, Hermes, and many more. Did you spy a Gucci leather shoe that you have to own? Perhaps a Lacoste polo shirt that you cannot live without? Many of their listings have the Buy-it-Now option, so you can nab your designer top, and even find a Marc Jacobs dress pant, a pair of Chanel shoes and a Burberry scarf to complete your outfit; and own it all instantly. Plus, PayPal is offered on over 90% of listings in the Apparel category, so you can bid and pay with confidence. So start shopping now for your clothing and fashion accessories at eBay. When was the last time you purchased clothing at an auction? Personally, as of this moment, I have not yet purchased menswear at auction. I often use the auction sites to purchase toys for my kids and baseball cards for myself (don't tell my wife). However, I have never actually purchased clothes at an online auction (or offline auction). When I think of auctions, my first thought has always been "used clothing". However, that thought is way off the mark... I have now learned that the auctions are filled with "NEW clothing". Certainly, you can find some used, but the majority that I am currently seeing is new clothes. In men's fashion, clothing options run the gamut from sophisticated suits to casual denim and t-shirts. Regardless of preference, men's apparel can easily be found to suit nearly every lifestyle and fashion need. Regardless if you are young or old, you can find both classic or modern styling of clothes on eBay. A well-rounded man's wardrobe typically consists of clothing suitable for business, recreation, and virtually anything in between. Men who are interested in presenting a refined and professional look may choose to wear button-down shirts and dress pants. For those who enjoy wearing relaxed clothing, men's fashion jeans lend a simple and carefree appearance. Individuals who prefer urban apparel often enjoy wearing cosmopolitan jackets and trousers. Men's fashion shoes provide a wide variety of options including vibrant athletic footwear, functional boots, and stylish dress shoes. 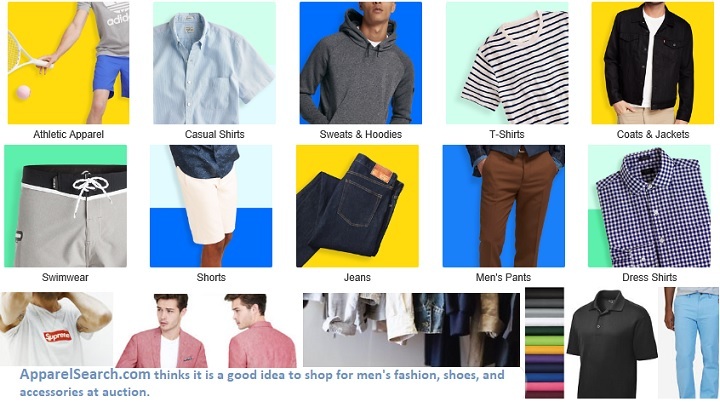 No matter what type of apparel a man prefers to wear, eBay provides access to an array of men's fashion clothing options.